A Radio Wave is an electromagnetic wave propagated by an antenna. Radio waves have different frequencies and by tuning a radio receiver to a specific frequency you can pick up a specific signal. "Radio waves" transmit music, conversations, pictures and data invisibly through the air, often over millions of miles, it happens everyday in thousands of different ways. Even though radio waves are invisible and completely undetectable to humans, they have totally changed society. Whether we are talking about cell phone, a cordless phone or any one of the thousands of other wireless technologies, all of them used radio waves to communicate. Frequency, one characteristic of a sine wave is its frequency. The frequency of a sine wave is the number of times is oscillates up and down per second. When we listen to an AM radio broadcast, our radio is tuning in to a sine wave with a frequency of around 1,000,000 cycles per second (cycles per second is also known as hertz). For example, 680 on the AM dial is 680,000 cycles per second. FM radio signals are operating in the range of 100,000,000 hertz, so 1015 on the FM dial is a transmitter generating a sine wave at 101,500,000 cycles per second. The list goes on and on. Communication and navigation satellites would be impossible without radio waves, as would modem aviation, an airplane depends on a dozen different radio systems. The current trend toward wireless Internet access uses radio as well, and that means a lot more convenience in the future. All radios today, however , use continuous sine waves to transmit information (audio, video, data). The reason that we use continuous sine waves today is because there are so many different people and devices that want to use radio waves at the same time. If we had some way to see them, you would find that there are literally thousands of different radio waves (in the form sine waves) around us right now. It is amazing how many uses there are for radio waves today. Each different radio signal uses a different sine wave frequency, and that is how they are all separated. The transmitter takes some sort of message, encodes it onto a sine wave and transmits it with radio waves. The receiver receives the radio waves and decodes the message from the sine wave it receive. Both the transmitter and receiver use antenna to radiate and capture the radio signal. Some home security systems also have remote controls, but these are not so common.The fob that we carry on our keychain or use to open the gate is actually a small radio transmitter. When we push a button on the fob, we turn on the transmitter and it sends a code to the receiver. Inside the car or garage is a radio receiver tuned to the frequency that the transmitter is using (300 or 400 MHz is typical for modern systems). The transmitter is similar to the one in a radio-controlled toy. In the very early days of gate openers, the transmitters were very simple. They sent out a single signal, and the gate opener responded by opening or closing. As gate openers became common, the simplicity of this system created a big problem ,anyone could drive down the street with a transmitter and open any gate.They all used the same frequency and there was no security. Nowdays,in this modern era,the technology become more advance. We can see this level of sophistication in the photos below. The first shows a controller chip(black) and a DIP switch (blue). 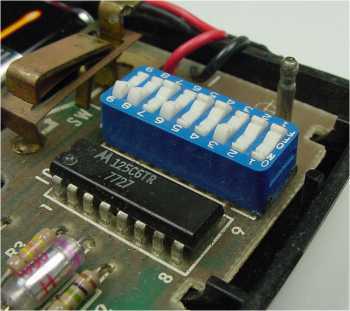 A DIP switch has eight tiny switches arranged in a small package and soldered to the circuit board. By setting the DIP switches inside the transmitter, we controlled the code that the transmitter sent. The gate would only open if the receiver's DIP switch were set to the same pattern. This provided some level of security, but not much. Eight DIP switches provide only 256 possible combinations. That's enough to keep several neighbors from opening each other's doors, but not enough to provide any real security. 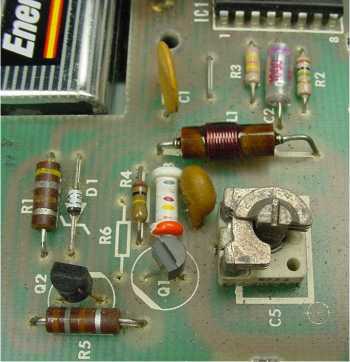 As we can see, the transmitter consisted of two transistors and a couple of resistors, and not much else. A two-transistor transmitter like this, powered by a 9-volt battery, is as simple as a radio transmitter gets. It's the same transmitter that we find in a power walkie-talkies. Remote-entry transmitters have gotten a lot more sophisticated since then. With the remote keyless-entry systems that we find on carstoday, security is a big issue. If people could easily open other people's cars in a crowded parking lot at the mall, it would be a real problem. And with the proliferation of radio scanners, we also need to prevent people from "capturing" the code that your transmitter sends. Once they have your code, they can simply re-transmit it to open our car. 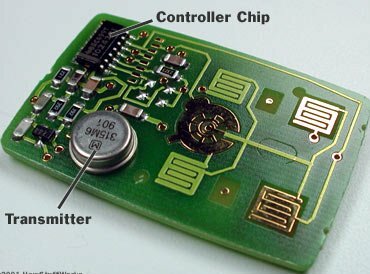 There is a small chip that creates the code that gets transmitted, and the small silver is the transmitter.The controller chip in any modern controller uses something called a hopping code or a rolling code to provide securitye. Forty bits provide 240 (about 1 trillion) possible codes. • The receiver's controller chip also has a memory location that holds the current 40-bit code. If the receiver gets the 40-bit code it expects, then it performs the requested function. If not, it does nothing. • Both the transmitter and the receiver use the same pseudo-random number generator. When the transmitter sends a 40-bit code, it uses the pseudo-random number generator to pick a new code, which it stores in memory. On the other end, when the receiver receives a valid code, it uses the same pseudo-random number generator to pick a new one. In this way, the transmitter and the receiver are synchronized. The receiver only opens the door if it receives the code it expects. • If we are a mile away from your car and accidentally push the button on the transmitter, the transmitter and receiver are no longer synchronized. The receiver solves this problem by accepting any of the next 256 possible valid codes in the pseudo-random number sequence the receiver would still accept the transmission and perform the requested function. However, if you accidentally push the button 257 times, the receiver will totally ignore your transmitter. It won't work anymore. We can also see that code capturing will not work with a rolling code transmitter like this. Older gate transmitters sent the same 8-bit code based on the pattern set on the DIP switches. Someone could capture the code with a radio scanner and easily re-transmit it to open the door. With a rolling code, capturing the transmission is useless. As we can see, the modern security setup help us improve its security. With frequency modulation application plus a pseudo-random number, it make better application device.people always looks for a better security in future. Might be, in this modern world live, FM application must be greater than the old times. There is no way to predict which random number the transmitter and receiver have chosen to use as the next code, so re-transmitting the captured code has no effect. With trillions of possibilities, there is also no way to scan through all the codes because it would take years to do that.